NORWAY: Since 2010, Sway Turbine (ST) has been one of companies racing to produce the world's first 10MW wind turbines. Now it is ready to reveal the design. Windpower Monthly technical writer Eize de Vries reports. Norwegian technology company Sway Turbine (ST) has introduced a striking 10MW offshore turbine featuring a 25-metre spoke-type direct drive permanent magnet generator (PMG). Designed for demanding IEC WC Is (10 metres/s+) conditions, the main specifications include 164-metre rotor diameter with three rotor blade supports (eliminating the need for a rotor hub), a 13m/s rated wind speed and 12rpm nominal speed. The ST10’s product development started in 2005 with the aim to finding a cost-effective low-weight solution for floating turbines (it is now for fixed foundations), and overcoming key challenges associated with turbine upscaling. ST co-founder and chief technical officer Eystein Borgen explained many of the ST10’s unusual design solutions, and other overall benefits compared to ‘conventional’ state-of-the-art offshore turbines. What immediately catches the eye about the turbine is the open generator, which resembles a large bicycle wheel, including rim, spokes and two central bearing housings. 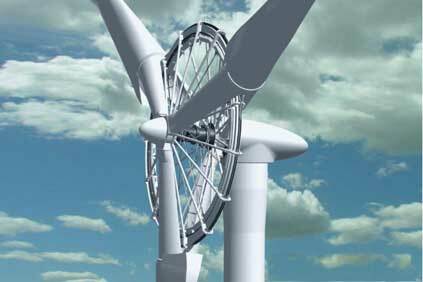 However the comparison stops there as the ‘rim’ is the axial flux generator incorporating the rotor and stator. The stator, supported by the inner spokes, is sandwiched in between two rotating rotor disks. Supported by thick spokes, the rotor disks are fitted with inward-facing permanent magnets. The generator is designed with an ironless stator core. Borgen explained: "A stator without laminated iron eliminates forces of attraction with the magnets. This ironless stator allows a ‘forgiving’ lightweight design with spokes and a large diameter, a bigger air gap and substantial air gap variation under load compared to conventional generators. We can also apply cheaper magnets without dysprosium, a scarce highly expensive rare earth." ST10 generator mass is only 162 tonnes, compared to around 375 tonnes for a conventional 10MW direct drive PMG that also features a 164-metre rotor diameter. For conventional generators a main design focus is at maximising structural stiffness, whereas the ST10 primary focus was at structural strength allowing more flexibility, Borgen said. Three inverted equally spaced V-shape blade support structures (BSS’s) sandwich the generator, adding to overall stiffness and stability. The pitch bearings are positioned 15-metres off the rotor centre. Speaking about the decision, Borgen said: "One benefit is a special direct coupling between blades, BSS’s and generator, which gives a short load path, and leaves the generator air gap unaffected by flapping -forward and backward- wind loads. Another benefit is that rotor torque and blade gravity loads in the rotor plane are distributed and absorbed by the entire structure." The ST10's blades are much shorter compared to conventional blades with similar rotor diameter, resulting into around 40-50% mass reduction and equivalent composite costs savings while pitch bearings can be smaller and cheaper. Each BSS is designed as a structural steel element and is not aerodynamically optimised. Prototype head mass has been determined at 625T, but is expected to reduce further at 570 tonnes. If the BSS were to be made in composite a further 40-tonnes mass reduction to 530T would be feasible. The overall solution should result into 15-20% lower turbine cost according to ST’s calculations. In terms of servicing, main components can be inspected/exchanged by an onboard crane and a work platform fixed to the tower. In addition there are specially developed inspection baskets and professional climbers can be called in when required. These offshore activities include exchange of generator segments up to claimed 10m/s wind speeds, but excludes blades and large bearings requiring crane vessels. In conclusion Borgen said: "Our custom-designed blade for 164m rotor diameter and 10m/s mean wind speed sites according our comparative calculations offers the best CoE performance, but additional rotor sizes serving different wind speed conditions are possible. 103m/s rated tip speed is higher but not the highest in industry and we will apply special erosion-resistant material for the rounded leading edge. Finally, aerodynamic noise is normally not an issue offshore while we benefit from 10–14% higher generator yields compared to 90-95 m/s tip speeds and similar power rating." ST is in the identifying process of finding a solid industrial partner to bring the ST10 to the general market.